Editor’s note: Pro cyclist Julian Kyer sent in this report from the road during his week at the Redlands Bicycle Classic, where he finished second on the individual time trial. Sick of eating on the road, Kyer challenged himself to make every meal from a rice cooker! Enjoy. After a nauseating breakfast in a Vegas casino—a more or less mandatory break on my drive to the Redlands Bicycle Classic—I cracked. I’d picked at $10 worth of grease-soaked omelette, cardboard-like toast, and out-of-season fruit for no apparent reason. While I was being served the exact things that are known contributors to Western lifestyle disease, sitting in a pleather booth, drinking terrible coffee and breathing any cigarette smoke with the temerity to sneak past the “non-smoking section” plaque and velvet rope, my brand new rice cooker was sitting in the hotel room, next to my race-ready breakfast box. Oats, rice, raisins, fresh organic fruit, almond and coconut butters, honey and almond milk were sitting in my room, two cups of water away from my ideal breakfast. I started thinking about Allen Lim’s fried rice, the congee for breakfast at last year’s Tour of Taiwan, my daily bowl of oats, and I realized the vast majority of what I needed as a bike racer could be churned out of the little six-cup rice cooker and its steaming tray. As we sped out of Las Vegas towards Redlands, I texted Allen Lim with a challenge: to see if every meal I prepared during the week could be churned out of the rice cooker. 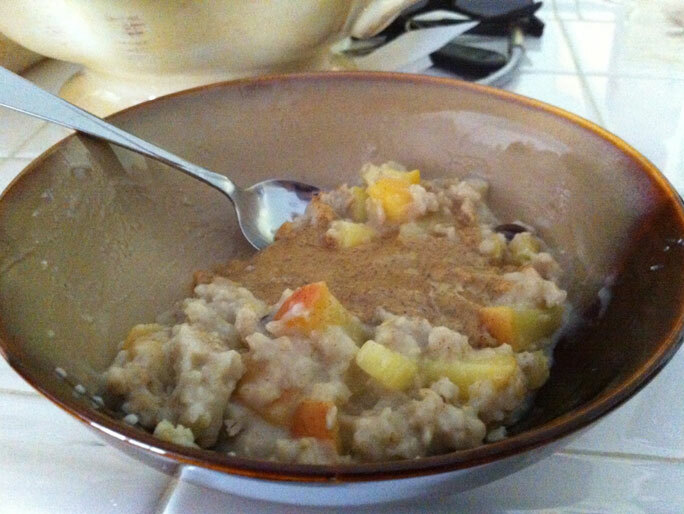 My twist on Biju’s Oatmeal recipe. I start every morning this way, and I never get tired of it. I even wake up excited that I get to eat oatmeal and drink coffee. This is a curious thing to admit but it turns out a lot of people feel this way. Here’s how I make it with the rice cooker: one part oats, one part coconut or almond milk, one part water. Shake in some cinnamon, toss in some fruit (I like raisins and chopped apple), whack the lid on and press the cook switch. When it’s done cooking, I stir in some honey and either almond or coconut butter. Easy. 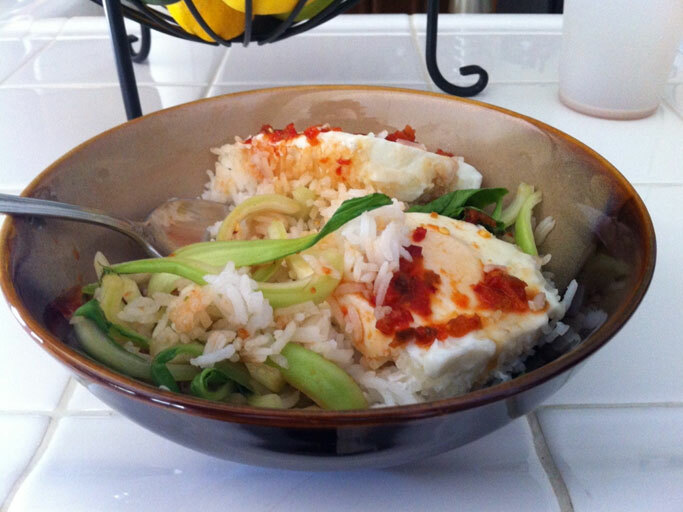 Rice and Eggs: Lunches and dinners can be a little more stressful to get right. This is a new staple of mine; it’s low-maintenance and you can throw it together quickly after a ride or race, and let it get cooking while you shower or collapse on the couch in a stupor. Start cooking some rice while you slice some veggies to put in the cooker’s steam basket (if you don’t have a steam basket, leave them raw or toss them on top of the eggs after you add them). Things like bok choy, bell peppers and spinach work well. Start the veggies steaming, and as the rice is just a few minutes away from being done, crack your eggs right on top of the rice—the steam will poach them in a few minutes. Once they’re done to your liking, scoop the rice and eggs into a bowl, put the steamed veggies on top and serve with a drizzle of sesame oil, Bragg’s Liquid Aminos and some Thai chili sauce. 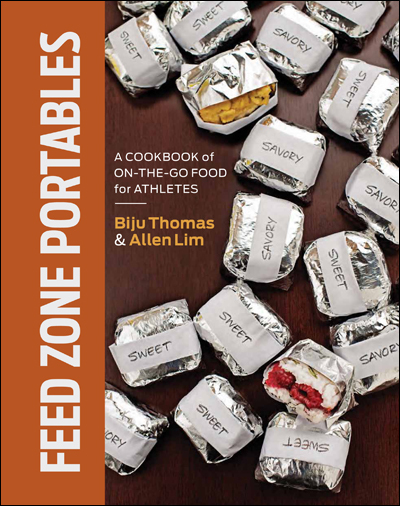 Things like The Feed Zone Cookbook’s rice porridge, soups or even scrambled eggs can be done in the rice cooker; I’ve even seen recipes for bread in the rice cooker, so your imagination is really the limit. Even though I had the full use of a well-stocked kitchen during Redlands, I wanted to show that good food is mostly about thought and care, that being stuck in a hotel room with no kitchen doesn’t mean eating at chains is your only option, a point I have happily proven to myself. I’m already excited for the cooker’s next trip. Julian Kyer is a professional cyclist riding with the Juwi Solar Cycling Team. He just placed second at a stage of the Redlands Bicycle Classic. You can follow him on Twitter, friend him on Facebook, and check out his race results at USA Cycling.